As some of you will know I used to work in a department full of ‘change management professionals’. Their job was to initiate projects that would improve procedures or systems within other departments. As you can imagine they were not always the most popular members of staff! The organisation was 250 years old and some of the employees had been working at the company their entire adult lives. They didn’t always take kindly to other people telling them what they had been doing for years and years and years needed to be improved. Thankfully my colleagues had an arsenal of change management tools that enabled them to deal with even the most stubborn of employees. This matrix is great because it is simple but it really makes you think about the people that might be affected by the changes you are going to introduce. Each number represents a different stakeholder. 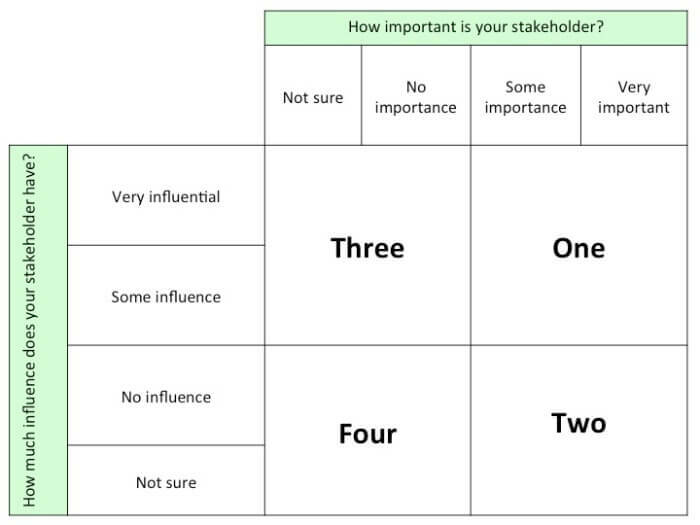 It is important to remember that stakeholders can move between each of these groups. These colleagues are your most important stakeholders and it is worthwhile you getting them onboard early. They have a high degree of influence and they are important within your organisation. They will most likely be senior members of staff but they might also be the individual that is most affected by your new procedures for example another assistant within your department. You will need to have a good working relationship with these stakeholders so that they support your project. If you don’t engage these individuals they might well jeopardise the changes you plan to make. Again these individuals are important to the success of your changes but they don’t have much influence in your department. These are the type of people that are easy to ignore, but they might not follow your new procedures and bring the project into jeopardy. You should invest in this group of stakeholders, listen to their concerns and make them feel part of the process. This is a risky group of individuals. They have significant influence but they have little interest in the project until it suddenly comes on their radar and they demand your attention. If this happens, they can have a huge impact. It is worth keeping an eye on these stakeholders, let them know what you have planned and make sure they are comfortable before you proceed. You can’t keep an eye on everyone, so this is group to spend the least amount of time with. Definitely bear them in mind when you introduce your changes but they have little interest and little influence so hopefully won’t cause you too much bother.